"Praxis is one-of-a-kind in Los Angeles. The staff and choreographers are amazing! They remind me why I love to dance!" Praxis is a non-profit, tax exempt organization. If you are interested in supporting us, you can mail us your donation check. 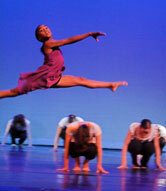 Or, feel free to contact us at info@praxisdance.org or 213-840-1766. Any donations made to Praxis Project are tax deductible. Thank you in advance for your support!